Tired of the same old salad? Salads don’t need to be boring. 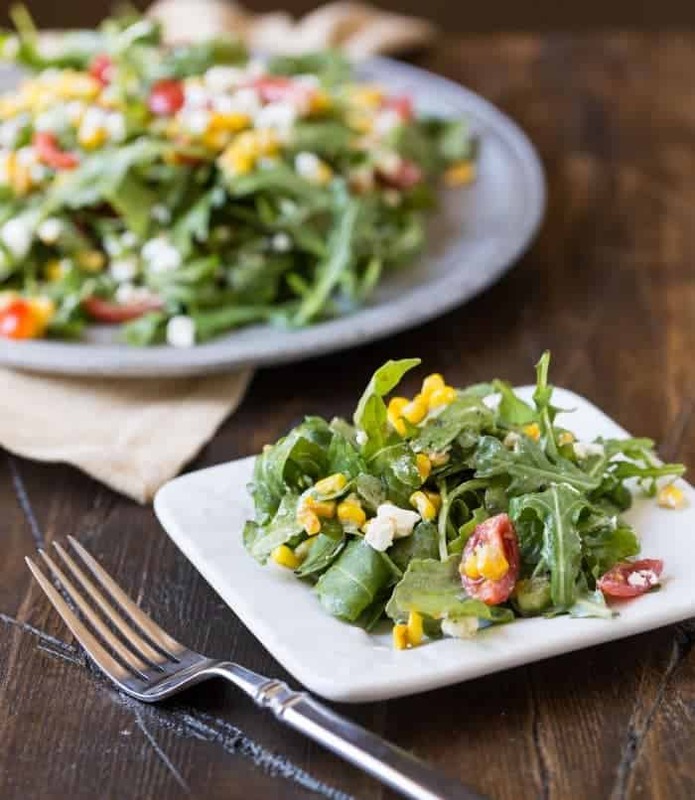 This Arugula Goat Cheese Corn Salad is simple, bright and full of great summer flavor! Summer sweet corn is the best, especially the first few times we make it. We start out purists, just eating grilled corn on the cob before we start mixing in some Mexican Grilled Corn and this Tomato, Mozzarella and Grilled Corn Salad. But that was before this Arugula Goat Cheese Corn Salad, which might just be my new favorite way to eat it. This is the quintessential salad of summer packed with all of my favorites. It’s like the fresh sweet corn, juicy garden tomatoes, peppery arugula and goat cheese were made for each other. And for such a short and simple ingredient list, it is packed with flavor. I can’t believe it has taken me so long to share this recipe with you. I first made this Arugula Goat Cheese Corn Salad last summer for book club and it has been a staple of mine ever since. Every time I make it, I fall in love with it just a little more. Besides being absolutely scrumptious, I love that I can make it ahead of time and let the gorgeous summer produce do all of the hard work. It has all of the requirements to make it a no-brainer for hosting friends on the patio. Simple. Fresh, Delicious. Tip: I make the most of summer sweet corn and freeze some just for this salad. This FoodSaver keeps it fresh all winter long. Heat 1 tablespoon olive oil in a large nonstick skillet over medium high heat. Add corn and cook until slightly charred. Remove from heat and let cool. 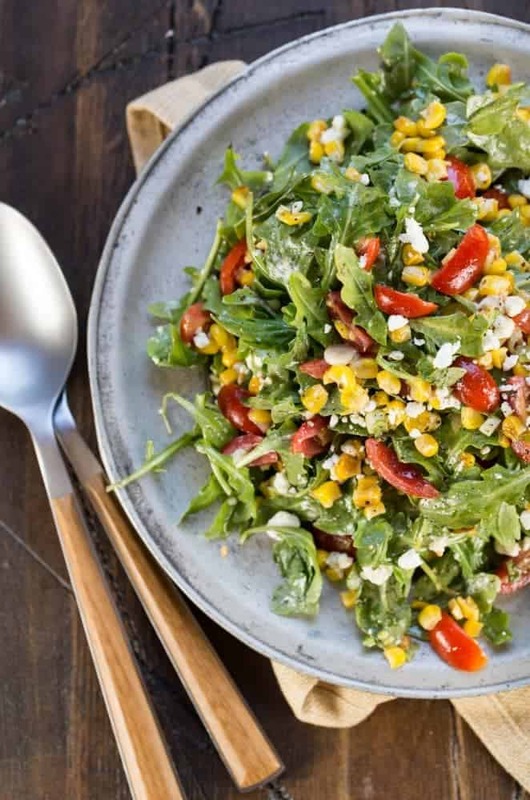 In a large bowl add cooled corn, green onions, tomatoes, goat cheese and arugula. Squeeze lemon juice over the corn mixture and add white wine vinegar and remaining olive oil. Stir gently to combine. Season to taste with salt and pepper. Hi, This is really good and tasty. Can I use spinach instead of arugula. Will this be good, did anyone try? Hi Anna, I haven’t tried it with spinach so I cannot speak to that. Let me know how it tastes! Yay! Thanks for your feedback, Jan! The roasted corn is the perfect finish to this salad!